MOApp Software Manufactory on Thursday announced the release of myTumblr, a Mac OS X blogging client for the popular Tumblr service. myTumblr aims to make your blogging easier, and MOApp describes it as “the sexiest way to blog without a browser.” It’s certainly true that the app sports an intuitive and wholly Mac-like appearance. Even better, unlike Tumblr’s own Web interface, myTumblr supports full drag-and-drop: find the photo you’d like to share and drag it onto myTumblr, and the app’s ready to plop that image right into your post. The app even supports resizing, cropping, and tweaking the image if needed, and optionally uploading it to an FTP server of your choosing. 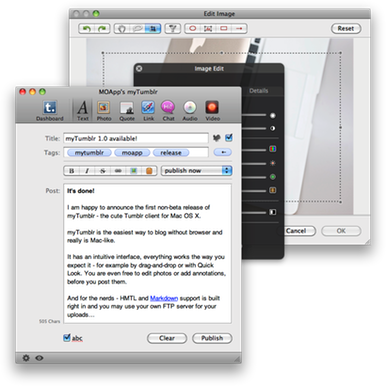 You can choose to write your posts using the app’s built-in rich text editor, HTML, or Markdown. MyTumblr costs $15 and requires Mac OS 10.5.8 (Intel) or higher.